The Kings of War (KOW) blog asked an interesting question a week or so ago. How good are we at tending leaders? 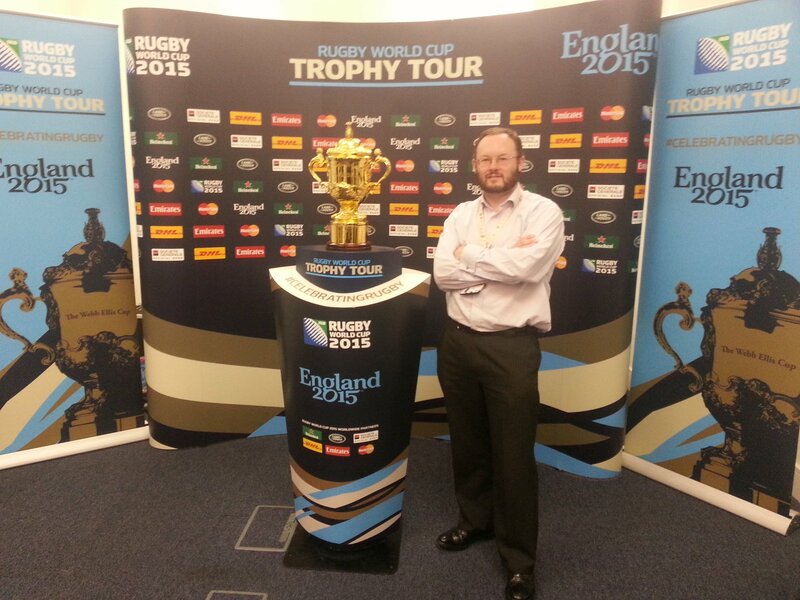 Me helping to promote the Rugby World Cup as part of tending leaders at work! While the KOW blog has a military perspective the original thought came from a police blog. I think the sentiment of loneliness of command also applies to civil servants too. Probably also to leaders in other spheres. I’ve had a few roles involving leadership of large numbers of people. I’ve also been fairly close to people who have done the same thing, more senior people than me. I’ve certainly seen them get isolated, and in some cases surrounded by sycophantic yessers. We need to keep tending leaders if we want them to be good. From my time running a passport office with over 300 people working for me I can personally attest to the difficulty of avoiding favouritism. Familiarity can make some of the difficult conversations harder. On the other hand, you do need a release valve and sometimes you need to talk through options with someone else who knows what it is all about. As a civilian this is easier than for the police or military leader. Even my hardest decisions didn’t really have much chance of deaths as a result. I did deal with deaths, I had people die of cancer and suicide of relatives. But nothing like an operational tour, nor a direct result of my decisions. The worst decisions I made were around sacking poor performers, or those with attendance problems or disciplinary offences. I also promoted and posted people within my command. All of those have direct personal impact on the team. When you become conscious of this it makes you stop getting close to people. Until you trust someone you cannot afford to be connected any more than professionally. Even then there is still the worry about how the disgruntled could twist it. This perspective only comes when you’ve had a major command. I’m not quite sure at what level, but certainly 100 plus. I think it is when you have multiple junior managers working for you. As a junior manager you only have your own small team to worry about, and there are plenty of people that you can talk to about it who are not affected by your decisions. When you get up the management chain a bit there are fewer people to share the burden with. Also more of those people are ambitious and see you as a competitor. They may also have learnt wariness and be reluctant to trust a new leader. You might also find yourself in a smaller organisation and closer to the tip of the pyramid. This limits your peer group too. So far I’ve not talked about what I have done about tending leaders. I think that tending leaders is very similar to how we should lead our staff. Firstly we need to remember that leaders are people too. They’re some of the most vulnerable people in the team. In some respects they can be single points of failure. Even when you don’t need the support yourself take the 1:1 with your boss. Ask them how things are for them. Talk about the weekend, the kids, the movies or whatever you know your boss enjoys outside work. This puts you in a personal space, but don’t be a sycophant. Engage in a real conversation. People can spot phoneys. Where you know stuff is controversial gather the evidence and talk the boss through it. You gain their trust in your competence this way. Also don’t leak info to people, if you are planning on telling your team about stuff clear it where you know it could be contentious. You lose trust by not keeping confidences. The best way of tending leaders is to be a reliable confidante. Gain their trust, share your experiences and keep secret the confidences the boss shares with you. That said, where you should share then make sure you do. Be reliable. What about you? How do you look after your leaders? This entry was posted in themself and tagged CCL-KOW, Leadership, Leadership development, Tending leaders by James. Bookmark the permalink. Next → Next post: Brexit – what will the European Union do?